OSP seeks to assure that Spelman puts forward the best applications for such opportunities and that access to limited opportunities is handled fairly and with transparency. Therefore, a review process is now in place to select applications. For those limited submissions that are annual or widely known to the Spelman community, OSP will publicize the opportunities on the blog and by email at least 4 weeks before the internal deadline. Other announcement will be publicized when OSP becomes aware of them. 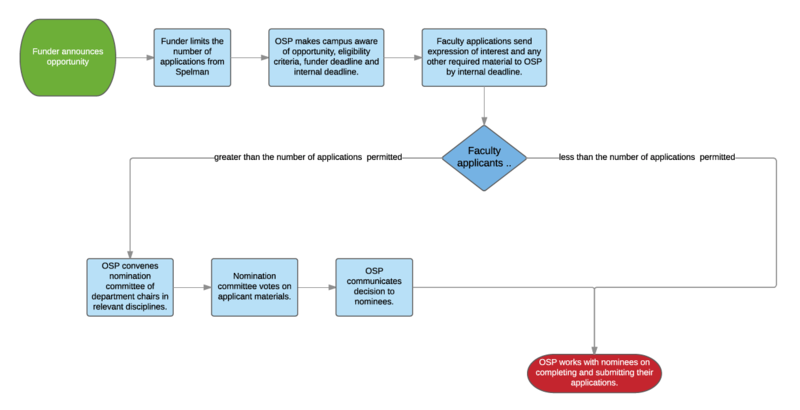 If an applicant knows that a potential grant opportunity has a limited submission, this information should be disclosed to OSP as soon as possible to ensure the timeliness of the internal nomination process. All limited submissions are subject to the review described herein regardless of the timeframe. Faculty are advised that they will have to prepare at least some of their application materials for limited submission opportunities well in advance of the funder’s published deadline. The internal deadline will typically be at least 7 weeks before the funder deadline, except in case where the funder requires a letter of intent. In the latter case, the internal deadline will be 2 weeks before the LOI deadline. Materials required for the review include the following and should be emailed to cscholz@spelman.edu on or before the internal deadline date. Certain programs may require additional materials. A committee will not be convened and review will not be necessary if interest in the funding opportunity is below the number of permitted nominations. If it is necessary to convene a selection committee, OSP, in collaboration with the offices of Research Resources and the Provost, will recruit faculty with adequate expertise to evaluate the candidates’ materials. The selection committee members should have related disciplinary expertise. Ideally, committee members should have past success in securing external funding and/or past experience on proposal review panels. The review committee will be asked to evaluate the materials using the funders’ guidelines to assess likelihood of success. Evaluation criteria may include: how well the project matches funder’s priorities, the applicant’s qualifications, and overall quality of the proposed ideas and methods. All else being equal, the selection committee may decide to privilege applications from junior faculty, those who do not have active research grants, and those seeking to re-start their research. OSP reserves the right to withdraw the nomination up to a week before the funder deadline if the nominee is deemed at risk of not completing the application or other requirements.